Sunrisers Hyderabad outclassed the Royal Challengers, in Bangalore in every department of the game to triumph by 8 wickets and register their first victory in the tournament. It required a quality all round display from the men in orange to pull off a thumping and much needed win and allow themselves to regain their confidence. David Warner, the skipper of the Sunrisers, won the all important toss and invited the home team to bat first. The Challengers went ahead with their new opening pair of skipper Kohli and the big man Gayle, to start the proceedings. Initially Chris Gayle seemed to continue like he did at the Edens, but soon RCB received their first blow as Gayle hit a delivery off pacer Praveen Kumar straight into the hands of Reddy in the 6th over. Virat Kohli seemed to be in quite a decent touch as he smashed balls, clearing the fence several times. Soon Dinesh Karthik at the other end smashed a ball off the spin of Karn Sharma which turned out to be fatal. He was soon followed by his skipper, who was bowled by Bopara and departed for 41 off 37 balls. The very next ball it was Mandeep Singh's turn, who fell prey to an excellent one handed catch by David Warner and had to leave for a golden duck. AB de Villiers the new man in for RCB seemed to be absolutely his usual self as he provided the team total some much needed stability and propelled the boat ahead. With him at the crease a big score appeared in the hindsight but RCB lost their last five wickets within a couple of overs and were bowled out for 166 with one ball left to be played. It was a terrific bowling performance from the Sunrisers, because to restrict a team batting first at the Chinnaswamy for just 166 in a t-20 game is no easy task. Trent Boult was the highest wicket taker, claiming 3 wickets but he leaked away runs at 9.00 runs per over. Bhuvneshwar Kumar and Bopara picked two wickets each while Karn Sharma, Reddy and Praveen Kumar had one wicket each reflecting against their names. The great bowling effort was followed up by a massive batting start by the Sunrisers which proved to be decisive for RCB. It was only the men in orange who dictated the terms as the Sunrisers got off to a flyer, getting their 50 upon on the board in merely 26 balls. David Warner looked to be in dangerous form taking the bowlers to the cleaners as he departed on 57 off 27 balls hitting six 4s and four giant 6s, but the damage was already done and the tone for a thumping victory was set. Shikhar Dhawan the other opener continued the carnage after Warner left. Kane Williamson coming with high expectations of him at number 3 failed by going back to the pavilion on a single digited score. Coming to the crease at number 4 young KL Rahul along with Dhawan wrapped up the game for Hyderabad. Some big hits came out from his bat too as he scored 44 of just 28 balls as SRH chased down the total in just 17.2 overs and took away the all important 2 points. 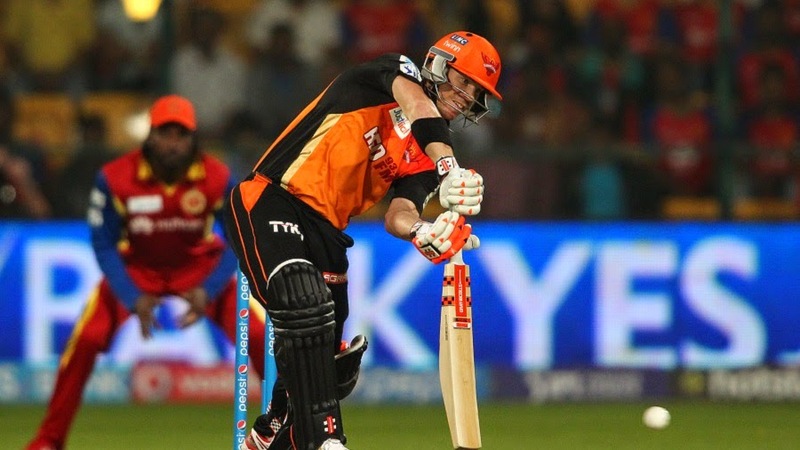 David Warner, the SRH skipper, was adjudged the man of the match for leading his team from the front. He snatched away the game from Bangalore from a batting effort which was nothing but sheer class. Talking of the Royal Challengers, they were 10 to 20 runs short put into bat first. They failed to capitalise on the start they got and could not convert it into a big score. Their bowling disappointed too. Apart from spinner Yuzvendra Chahal all bowlers went wicketless and gave away far too many runs. It being just the initial stage of the tournament they will want to get things into place before it's too late. With Adam Milne looking to regain fitness and Mitchell Starc coming to India in the coming week their bowling will get a much needed boost. As for the Sunrisers Hyderabad, their confidence will be on a high and they will be looking to carry their momentum forward. Royal Challengers Bangalore play Mumbai Indians on 19th April at home while the Sunrisers Hyderabad take on Rajasthan Royals in their next game on 16th April. Sunrisers thrash the Challangers by 8 wickets and bounce back in style.